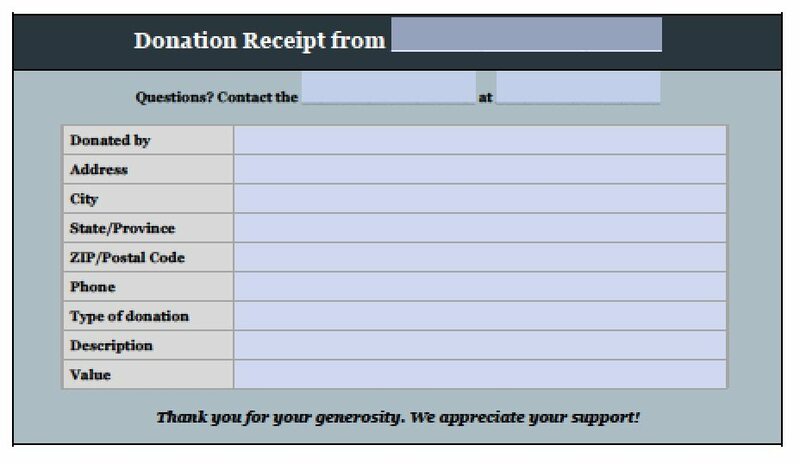 Download the donation invoice template, which acts as a receipt for the donor and the recipient to record the donation’s details. Be sure to include the type of donation, the amount or value, and each party’s contact information. Keep organized records of donations made and received, as these are tax-deductible for donors if your organization qualifies as a charity under IRS regulations. Donation Receipt – Due to IRS regulations, if an individual would like to have the donation as a tax-deduction they will need to collect a receipt from the 501(c)(3) non-profit organization. Search Eligible Charities – Use this Search Tool by the IRS to view if a charity is valid for tax-deductions. Step 2 – At the top, enter the name of your organization. Enter its contact information below that. Step 3 – In the table, write the name, address, and phone number of the person or organization that made the donation. Step 5 – Finally, enter the value of the goods or the amount of cash. Describing the donation and noting the value will help each party later when itemizing figures to file their taxes. Step 2 – In the header, enter the name of the organization receiving the donation. Enter the contact information for the organization just below. Step 3 – Write the donor’s name at the top of the table, then enter the address and phone number of the donor. If the donor is an organization, enter the organization’s name at the top instead. Step 6 – Write the total value of the goods donated or the total amount of cash. Save a copy of the receipt for your records.